Thich Nhat Hanh, a Vietnamese Zen Buddhist monk, is acclaimed worldwide as a peace activist, author, and teacher. His books and lectures have had a huge impact on western Buddhism. Called "Thay," or teacher, by his followers, he is particularly associated with the devoted practice of mindfulness. Nhat Hạnh was born in 1926, in a small village in central Vietnam, and named Nguyen Xuan Bao. He was accepted as a novice at Tu Hieu Temple, a Zen temple near Hue, Vietnam, at the age of 16. His dharma name, Nhat Nanh, means "one action"; Thich is a title given to all Vietnamese monastics. He received full ordination in 1949. In the 1950s, Nhat Hahn already was making a difference in Vietnamese Buddhism, opening schools and editing a Buddhist journal. He founded the School of Youth for Social Services (SYSS). This was a relief organization dedicated to rebuilding villages, schools and hospitals damaged in the Indochina War and the ongoing guerrilla war between South and North Vietnam. Nhat Hanh traveled to the U.S. in 1960 to study comparative religion at Princeton University and lecture on Buddhism at Columbia University. He returned to South Vietnam in 1963 and taught at a private Buddhist college. Meanwhile, the war between North and South Vietnam grew more volatile, and U.S. President Lyndon B. Johnson decided to intervene. The U.S. began sending ground troops to Vietnam in March 1965, and U.S. bombing raids of North Vietnam began shortly after. In April 1965, students at the private Buddhist college where Thich Nhat Hanh was teaching issued a statement calling for peace -- "It is time for North and South Vietnam to find a way to stop the war and help all Vietnamese people live peacefully and with mutual respect." In June 1965, Thich Nhat Hanh wrote a now-famous letter to Dr. Martin Luther King Jr., asking him to speak out against the war in Vietnam. Early in 1966 Thich Nhat Hanh and six newly ordained students founded Tiep Hien, the Order of Interbeing. a lay monastic order dedicated to practicing Buddhism under Thich Nhat Hanh's instruction. Tiep Hien is active today, with members in many countries. In 1966 Nhat Hanh returned to the U.S. to lead a symposium on Vietnamese Buddhism at Cornell University. During this trip, he also spoke out about the war on college campuses and called on U.S. government officials, including Secretary of Defense Robert McNamara. He also met with Dr. King personally, again urging him to speak out against the Vietnam War. Dr. King began to speak against the war in 1967 and also nominated Thich Nhat Hanh for a Nobel Peace Prize. However, in 1966 the governments of both North and South Vietnam denied Thich Nhat Hahn permission to re-enter his country, and so he went into exile in France. In 1969, Nhat Hanh attended the Paris Peace talks as the delegate for the Buddhist Peace Delegation. After the Vietnam War ended, he led efforts to help rescue and relocate the "boat people," refugees from Vietnam who left the country in small boats. In 1982 he established Plum Village, a Buddhist retreat center in southwestern France, where he continues to live. Plum Village has affiliate centers in the United States and many chapters around the world. In exile, Thich Nhat Hanh has written a number of widely read books that have been enormously influential in western Buddhism. These include The Miracle of Mindfulness; Peace Is Every Step; The Heart of the Buddha's Teaching; Being Peace; and Living Buddha, Living Christ. He coined the phrase "engaged Buddhism" and is a leader of the Engaged Buddhist movement, dedicated to applying Buddhist principles to bring change to the world. In 2005 the government of Vietnam lifted its restrictions and invited Thich Nhat Hanh back to his country for a series of brief visits. These tours stirred up more controversy within Vietnam. There are two main Buddhist organizations in Vietnam—the government-sanctioned Buddhist Church of Vietnam (BCV), which is tied to the Vietnamese Communist Party; and the independent Unified Buddhist Church of Vietnam (UBCV), which is banned by the government but which refuses to dissolve. Members of the UBCV have been subject to arrest and persecution by the government. When Thich Nhat Hanh re-entered Vietnam, the UBCV criticized him for cooperating with the government and thereby sanctioning their persecution. The UBCV thought Nhat Hanh was naive to believe his visits would help them somehow. Meanwhile, the abbot of Bat Nha, a government-sanctioned BCV monastery, invited Thich Nhat Hanh's followers to use his monastery for training. In 2008, however, Thich Nhat Hanh, in an interview on Italian television, offered the opinion that His Holiness the Dalai Lama ought to be allowed to return to Tibet. The government of Vietnam, no doubt pressured by China, suddenly became hostile to the monks and nuns at Bat Nha and ordered them out. When the monastics refused to leave, the government cut off their utilities and sent a mob of policemen to break down the doors and drag them out. There were reports that monastics were beaten and some nuns sexually assaulted. For a time the monastics took refuge in another BCV monastery, but, eventually, most of them left. 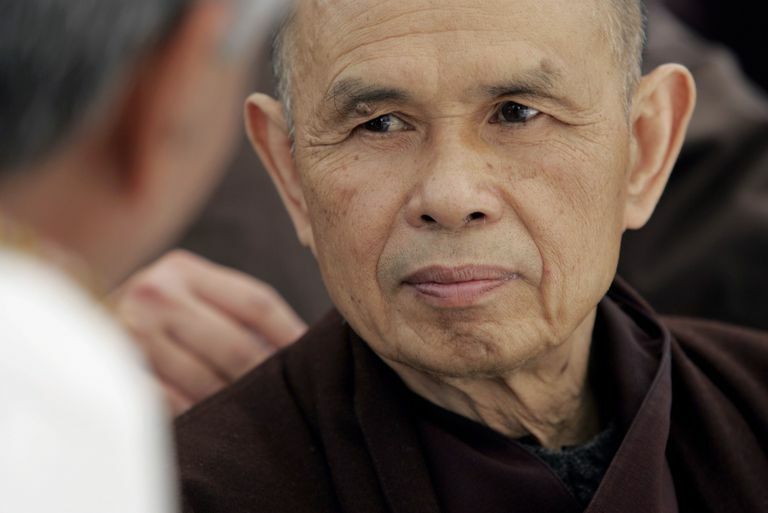 Thich Nhat Hanh has not been officially dis-invited from Vietnam, but it's not clear whether he has any plans to return. Today Thich Nhat Hanh continues to travel the world, leading retreats and teaching, and he continues to write. Among his most recent books are Part-Time Buddha: Mindfulness and Meaningful Work and Fear: Essential Wisdom for Getting Through the Storm.